Usually, I never go anywhere without a book, but on the recent bank holiday Monday I inexplicably found myself in Bournemouth with three and a half hours to kill before that evening’s Bellowhead concert and no book with which to attack them. It’s probably because I travel everywhere by train so I’m used to needing at least one book (although best to have two in case of delays), but on this particular occasion the Old English Thorn and I had driven to our destination and so I found myself in the unusual situation of being bookless. What could we possibly do under the circumstances but buy something to read? Unperturbed, we headed to the nearest Waterstones to pick up something to fortify us for the next few hours while we waited for our concert to begin, and emerged with the first two books of Brent Weeks’ Night Angel Trilogy and The Prince of Mist by Carlos Ruiz Zafon. Zafon’s first book to be published in English, The Shadow of the Wind, was one of my favourite books that I read last year. I’d picked it up from the university campus Waterstones (long since closed) back in my first year and it had remained unread on my shelves for the next five years, but as The Prince of Mist was needed for immediate emergency reading thankfully it was spared such a fate. The Prince of Mist tells the story of Max and his family who move from the city to a sleepy seaside town in order to avoid the effects of the war. Max and his elder sister Alicia soon make friends with Roland, a local boy who shows them around and takes them diving by the wreck of an old cargo ship. However, though the town is quiet the Carver family house is full of mystery and has a tragic past. The statues in the walled garden seem to move, a strange cat adopts the family and voices can be heard in the walls. Then disaster strikes, causing Max and Alicia to be left alone in the house to face the enigmatic Prince of Mist. One of the things that I remember about The Shadow of the Wind is how well Zafon conjures up atmosphere, and The Prince of Mist continues that; although it is a young adult book and a very swift read it is gripping and immersive. The contrast between the quiet, unthreatening setting where Max cycles around on his own, buys sticky buns from the bakery and ‘gossip moved at the speed of boredom‘ (p. 140) and the chilling atmosphere which accompanies the main action of the story is cleverly achieved. The supernatural elements seem even more eerie because of the stark way in which they stand out against the cheerful little town which Max’s father has specifically (and ironically) chosen as somewhere to keep his family safe. Although this is the third of Zafon’s books to be translated into English, it was his first novel in Spanish, and it lacks some of the polish of The Shadow of the Wind (although this may partially be because of the different target audience). There are several aspects of the novel which would benefit from a clearer, more defined explanation. Amongst other things, I wanted to know why the statues in Max’s garden kept moving and what was the significance of that beyond general menace. I enjoy a bit of supernatural ambiguity in novels like this, but in The Prince of Mist it felt less like deliberate concealment for dramatic effect and more like things which just weren’t explained. Apparently this is the first book in a trilogy, so I can only hope that some of these things are expanded more fully in the later books. Nonetheless, Zafon writes a compelling story and I shall be continuing to collect them as they are translated into English. 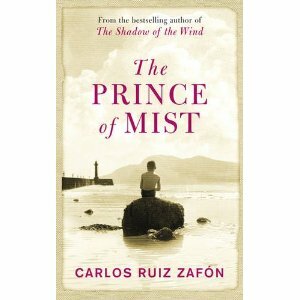 The Prince of Mist by Carlos Ruiz Zafon, translated from Spanish by Lucia Graves. Published by Phoenix, 2011, pp. 213. Originally published in 2006.